Well, would you believe it? A bank holiday weekend when the sun shone every day! That posed a dilemma for me: sunshine equals blissful relaxing reading in the garden, but it also gives rise to lots of other summery possibilities...and this time round, I spurned my books! Day 1 of the long weekend saw me and hubby mooching around the lovely town of Marlow and scouting for designer bargains in the charity shops. We had lunch in the garden and then got all DIY and mixed concrete to repair our back step. On Sunday we dined al fresco with a Thai meal at church and then met up with Child 1 plus fiance to discuss weddingy things. It was on Monday where things became a bit more alternative. Long-suffering my wistful desires to have married a farmer called Robert and ride tractors, hubby bought me A Day In The Country tractor driving experience. He realised that he could do nothing about desires 1 or 2, but 3 was solvable! So it was that we found ourselves in Aynho on the Oxfordshire, Northamptonshire border, where I could put my farm skills to the test. We arrived to find I was one of three would-be farmers; perhaps predictably, I was the only girl! Sticking to polite convention, the gents decided I should go first on a vintage tractor with trailer around a slalom course. No pressure there then. Pride and adrenalin surged as I was determined not to fulfil the stereotype of a female driver and, I'm pleased to say, I was pretty sharp! That wasn't the case on the bigger, butch JCB and giant tractor...the boys were better than me at the computer-style boom operations and they were soooo much better than me at reverse parking with a 14ft trailer, (those who have laughed whilst I try to reverse park my Polo will not be surprised that that bit was my most challenging moment!) But all in all, I wasn't bad. So, if anyone has a farm and a need for a very nifty vintage tractor driver who can cultivate in a straight line, then message me! And all this excitement has taken me away from the printed page, but I have read three books since the last post. 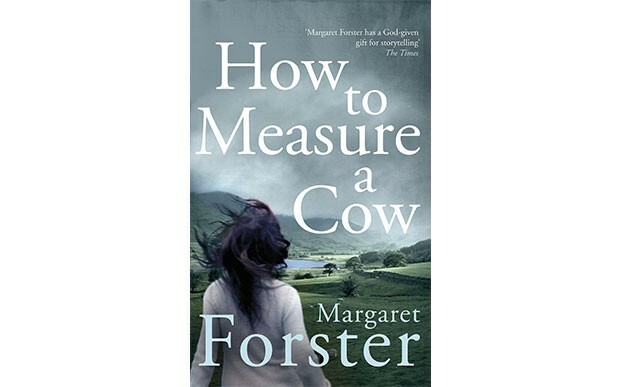 The first was the appropriately agriculturally-titled, How To Measure A Cow by Margaret Forster. And I'm pleased to say that the book did deliver on its aim. I now know that to measure a bovine I need to go from the shoulder to the second joint of the tail, multiply that length by 5 and divide by 21 to get the weight! I'm sure this is a very useful skill to someone! The storyline was, I have to admit, disappointing. The main premise is that Tara, now "Sarah Scott" is living with her new identity in a town in the north of England in order to start afresh following a long spell in prison. Despite auguring well, the characterisation and plot never fully deliver. Sarah is an invention which Tara Fraser finds hard to maintain. Through encounters with an elderly neighbour and three former friends, all of whom are stereotypes and fail to become fully rounded characters, Tara's former life is revealed. By the ending (no spoilers, though I wouldn't give this book your time), I was nonplussed and totally unconvinced by her past history or present situation. One that despite its engaging title, will be bypassing my shelves and going straight to the charity shop. My second read was also less than inspiring, but its author has so many accolades I think I must be missing something. It is a novella by Philip Roth called Goodbye Columbus. Motivated by the A-Level reading list for this module, I am attempting to lead by example and encourage my students to read beyond the set texts. I think however, that they can miss this one out! It is a coming of age novel, centred on a summer of sexual awakening in America in the 1950's or thereabout. Young lovers meet around an outdoor pool and end up making a clandestine visit to a doctor to get the Dutch Cap. Their couplings are eager and furtive but have a temporary air about them. Indeed it is all rather symbolic...even their names don't seem to matter, other than that they denote them as Jewish Americans. Neither Neil nor Brenda ever become fully developed characters. It was always more about the experience than the romance, and the young couple cannot survive once they are found out. And perhaps it is this that means I don't like the book. Maybe I am more of a romantic than I give myself credit for. So by this time I'm getting desperate for a book where the characters have some heart. 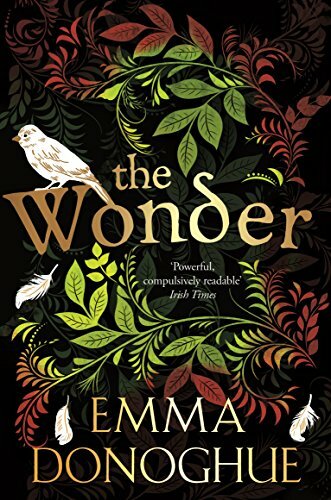 I turned to Emma Donoghue's, The Wonder. I liked The Room and I admit, I was totally attracted to the very beautiful cover (though the lettering on the spine did rub off on my thumb!). This is set in Ireland in the late nineteenth century, with Lib Wright, the protagonist, being a nurse who had served and trained with Florence Nightingale in the Crimea. This assignment is very different however, and allows the author to probe the religious beliefs and superstitions that cloak Catholic Ireland at the time. She is employed to watch Anna, an eleven-year-old girl who, so her parents, doctor and priest purport, has not eaten for the four months since her birthday. Lib recognised the physiological impossibility of this and sets out to disprove the stories of manna and miracles. She discovers however, that Irish beliefs run deep in this central part of the country, long scarred by English colonialism and the famine roads that leaded to nowhere other than humiliation and death. Breaking the fast and saving Anna's life become a mission that Lib had not expected. As the story unfolds the book becomes more than a competition between rationality and superstition, between science and faith, as the child's past holds more conflicts and contradictions than Anna can cope with. The plot line works well. It is a gentle story where the setting and premise do not change. It is ostensibly a story about a nurse who tries to persuade a child to eat. Much of the novel takes place in the dark mud walls of Anna's bedroom. And yet it is compelling. It centres around understanding people and making sense of their actions. And so I finally got to read a book this month where character is at its heart. It is an easy, well-constructed read. Some of the minor characters are less convincing, (William Byrne is a bit disappointing, but he serves well as a plot device), but it is a book I would recommend. It will be added to my bookshelves! My next read is Where My Heart Used To Beat by Sebastian Faulks. I am a bit of a Faulks fan, so my expectations are high. I am also very fond of the book already as it is a signed copy that has survived a night in the airing cupboard following a bedside table spilt water incident! As always,thanks for reading. Please feel free to share and comment! I thought The Room was good so now looking forward to The Wonder - thanks. I enjoyed Where My Heart Used to Beat and look forward to hearing your experience.